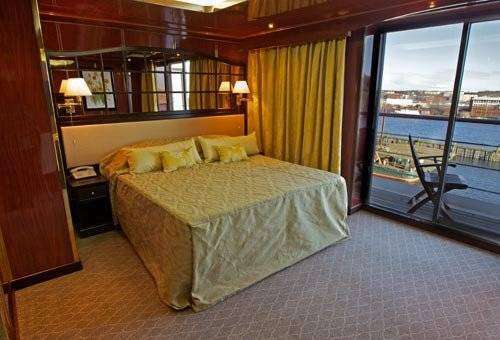 Vessel Type: Luxury Expedition Length: 90 metres Passenger Capacity: 114 (in 57 suites) Built: 1991 / refurbished 2012 The MS Caledonian Sky accommodates a maximum of 114 passengers in 57 spacious outside suites. Many have walk-in wardrobes and some feature tub baths. There will be seven categories of suites and sixteen suites will have private balconies. For those familiar with the MS Island Sky she will feel like a second home, although there are some differences. 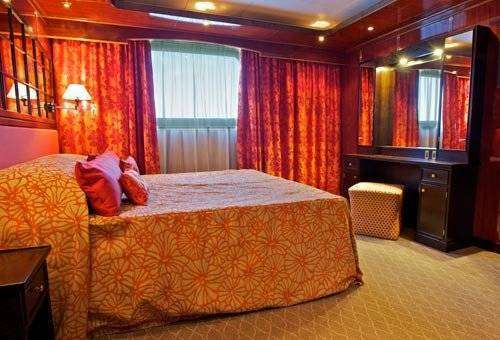 The dining room, lounge, Lido Deck and bar are all similar. However, the ‘Club’ on the MS Caledonian Sky has been transported to the very top deck. Here, there is a library and bar which leads out on to a lovely forward deck. The ‘Club’ has wonderful views with ceiling to floor windows. If you like the MS Island Sky, we are sure you will also approve of her sister. And, of course it is important that we offer the very best of facilities. However, equally as important are the staff on board whether they are the vessel’s crew or our own expedition staff. Noble Caledonia’s reputation has been built on providing the very best in all areas. Their crew of 74 not only offer an excellent service they are also noted for their kindness and attention to detail. 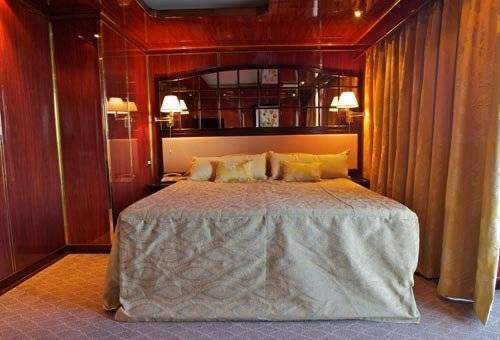 A well run ship with a warm atmosphere is what we are known for, and it is because most of our crew have been with us for many years that we are able to engender such an atmosphere. 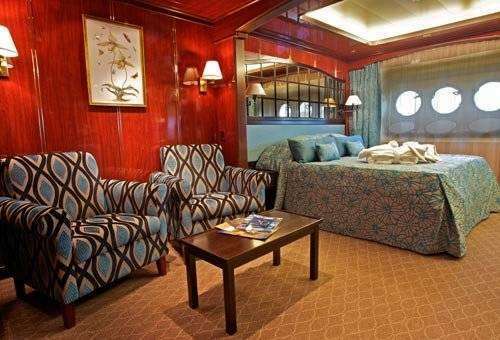 Your Suite Onboard there are 57 exceptionally spacious and well designed suites. 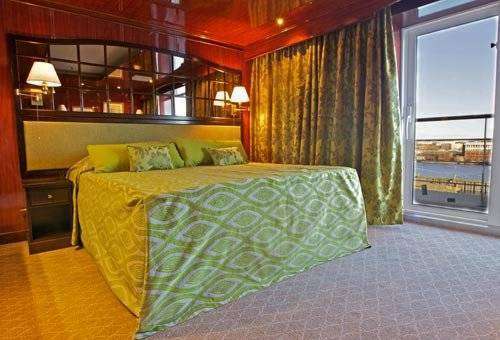 The passenger accommodation is arranged over four decks and all suites have outside views. All feature a sitting room area and some have private balconies. Each affords considerable comfort with en-suite bathroom featuring a country style wash basin, hot towel rack and vanity unit with sink and walk-in shower and/or bath tub. Facilities in the suites also include walk-in or spacious wardrobes, dressing table with large mirror and stool or desk, mini-fridge, flat screen television, telephone, programmable electronic safe, hairdryer, assorted toiletries, air-conditioning and heating. Bottled water, towelling dressing gowns and slippers are also provided for your comfort. Your space The spacious and finely decorated public rooms include a large lounge where daily briefings and talks will be provided throughout the voyage and an elegant bar where a pianist plays periodically throughout the day. The bar also features a 24-hour tea and coffee station. In addition there is the Club Lounge on the Panoramic Deck which features a bar. The onboard travel library is the perfect place to relax with a book and is stocked with reference books pertaining to the places the vessel is visiting along with a selection of games and two computers with internet access. Daily newspapers and magazines are also placed in the library depending on local availability. Outside there is a rear Lido deck where meals are served in warm weather under shade. On the top deck there is a further observation and sun deck with bar service and comfortable deck furniture for sun bathing or relaxing with a book. There is also a small gymnasium onboard and hairdressers with appointments made on request. Your dining With only one sitting and a maximum of just over 100 passengers, the quality of cuisine will be of a consistent superior quality. Where possible and when it meets his high standards, our accomplished chef will obtain local produce in markets or buy the catch of the day from a passing fishing boat. Such purchases enhance the well stocked larders and bring a local touch to the varied menus. In the main elegant dining room, breakfast is served buffet-style, with certain items cooked to order and lunch and dinner is à la carte. When weather permits, breakfast, a buffet-style lunch and dinner are also served on deck. To enhance your dining experience even further a selection of wines are included with lunch and dinner. Afternoon tea is served in the lounge and tea and coffee are available 24 hours. With sufficient notice, most diets can be catered for on board. For your comfort, safety and security The vessel is equipped with the latest safety, navigation and communications equipment along with roll stabilisers to minimise the ship’s motion. The Captain and officers operate an open-bridge policy that allows passengers onto the bridge at most times with the exception of arrival and departure from port and during times of complicated navigation. Here you can check the ship’s progress by charts and learn more from the officers about your journey. There is also a dedicated channel on your television in your suite showing the routing of the vessel along with technical information and estimated times of arrival and departure from port. On board you will also find a clinic and doctor and a lift that serves all decks. Smoking on board is restricted to outside decks only. Gratuities Unlike many other cruise vessels, onboard the MS Caledonian Sky you do not need to worry about tipping staff as we have included them in your holiday price. In addition we tip all their guides and drivers along the way, thereby taking away the hassle of always having to remember to have some small change with you. Day 1 - Day 1 - London to Mauritius. Day 2 - Day 2 - Mauritius. Day 3 - Day 3 - Mauritius. Day 4 - Day 4 - Reunion. Day 5 - Day 5 - At Sea. Day 6 - Day 6 - Ile Sainte Marie, Madagascar. Day 7 - Days 7 & 8 - Nosy Mangabe & Masoala National Park. Day 8 - Day 9 - Diego Suarez. Day 9 - Day 10 - Nosy Hara. Day 10 - Day 11 - Nosy Tanikely. Day 11 - Day 12 - Mahajanga. Day 12 - Day 13 - At Sea. Day 13 - Day 14 - Morondava. Day 14 - Day 15 - Tulear. Day 15 - Day 16 - Tulear to London. Day 16 - Day 17 - London. Enjoy the in-depth exploration of Madagascar. 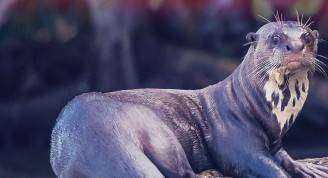 Madagascar is special in the diversity of flora and fauna and the amount of endemic species that call it home. Visit a number of national parks where we hope to spot rare lemurs, unique baobabs, endemic birdlife and explore the underwater world on snorkelling trips.